Immediately after 9/11, government officials and commentators claimed that the terrorist attacks had changed everything. In contrast, economist and historian Robert Higgs warned that history would likely repeat itself in one key respect: the governments hasty reactions would resemble its responses to previous crises, providing little more than opportunities for special interests to feather their nests and for the government itself to expand its powers at the expense of the publics wealth and civil liberties. Resurgence of the Warfare State is Robert Higgss real-time analysis of the U.S. governments tragic but predictable response: the quick enactment of the USA PATRIOT Act, the federal takeover of airport security, the massive increase in defense and other government spending, and the carnage in Afghanistan and Iraq wrought by leaders unaccountable for their costly and deadly mistakes. Governmental responses to crises have beenand will likely continue to bea bonanza for political, corporate, and even religious opportunists who seek power and ﬁnancial gain by exploiting the fears of the American public. Chapter 10: Will the Draft Rise from the Dead? Chapter 16: If Were Really in Danger, Why Doesnt the Government Act as if Were in Danger? Chapter 20: How Does the War Party Get Away with It? Chapter 26: Is Bush Unhinged? Chapter 31: Why the Rush to War? Chapter 37: Are Pro-war Libertarians Right? Chapter 40: Whats So Special About Those Killed by Hijackers on September 11, 2001? Chapter 42: Has the U.S. Government Committed War Crimes in Afghanistan and Iraq? Chapter 45: Can Bullets and Bombs Establish Justice in Iraq? Soon after the terrorist attacks of September 11, 2001, the news media contacted Independent Institute Senior Fellow Robert Higgs, whose 1987 book Crisis and Leviathan: Critical Episodes in the Growth of American Government explained how national emergencies have increased the size of government at the expense of individual liberty. The steady demand for press inter-views prompted Higgs to author scores of newspaper op-eds, think-tank policy briefings, and Internet postings in which he argued that the U.S. governments response to 9/11, like its responses to past crises, was taking us down the road to more government and less liberty. 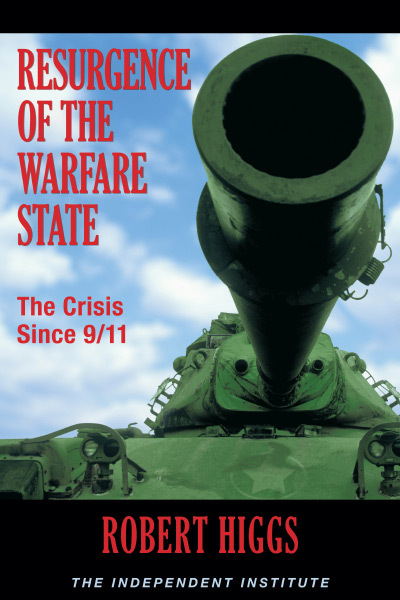 Resurgence of the Warfare State: The Crisis since 9/11 brings together Robert Higgss real time analyses of the U.S. response in the three-and-a-half years that followed the September 11th terrorist attacks. Higgs paints a bleak picture, showing how Americas political leaders in the name of crisis management have discarded many of the checks and balances created to thwart potential abuses of government power, spent additional billions of dollars on programs unrelated to national security, trampled civil liberties and due process at home, and pursued reckless military adventures that have needlessly killed thousands of innocents abroad. Major crises such as the Great Depression and the world wars prompt the public to demand that the government do something. When the crises end, many emergency actions cease but not all. Each emergency thus ratchets up the size of government and diminishes our economic and personal freedoms. The U.S. response to 9/11 has repeated this pernicious pattern, Higgs explains. Nine days after 9/11, Higgs told Reason magazine (in an interview reprinted in chapter 1) that the war on terrorism would again enlarge the governmenteven in ways unrelated to national securitydoling out pork to well-connected interest groups and bringing us ever closer to the realization of the Big Brother State. James Madison, the architect of the U.S. Constitution, had warned that war is the worst enemy of liberty, Higgs observes. Two examples of how 9/11 has panicked people into advocating bad policies are the federalization of airport security and calls for reinstating the draft. The Transportation Security Administration was created to try to assure air passengers that the federal government was making them safer. But like other large bureaucracies, the agency soon suffered scandals that suggest it lacks real accountability and is prone to politicization. Proponents of military conscription claim that improving pay and benefits wouldnt entice enough people to join the military, but the national glory rhetoric of draft advocates suggests that theyre not very interested in trying to find out. Favorable talk about reinstating the draft indicates that in post-9/11 America, freedom has many fair-weather friends who would sacrifice liberty for security (and likely make us less secure). Forty years of Cold War military spending did not protect the Pentagon and the Twin Towers from a devastating attack. The Pentagon wasand still isspending billions on Cold Warera arms and equipment and devoting relatively few resources to counter the new threat of terrorism. Never satisfied until a maximum amount of the defense budget has been diverted toward buying votes for their reelection, members of Congress strongly resist reallocations away from the established Cold War programs that currently channel taxpayer money to their political backers, Higgs explains. He also takes on three popular myths about the Defense Departmentas well as a few sacred cows about the White House leadership itself. President George W. Bush has spoken of his so-called "faith-based" domestic initiatives, but his foreign policy also warrants that label, given its clash with the empirical realities that have plagued nation-building throughout history, Higgs argues. Bushs ambitions of wartime greatness parallel the flaws promoted in a book he reportedly has read, The Supreme Command: Soldiers, Statesmen, and Leadership in Wartime, by neo-conservative war hawk Eliot A. Cohen. Higgss analysis of the pre-war rationale for the March 2003 U.S. invasion of Iraq was prescient. The evidence for Saddam Husseins WMD programs proved highly flawed. Also, Bushs breach of John Quincy Adamss dictum (America goes not abroad in search of monsters to destroy) was soon seen by many as naked aggression. Members of Congress failed to challenge the Presidents unconstitutional assertion of war-making power. The White Houses pre-war prevarications followed a presidential tradition, Higgs argues, citing William McKinleys insincere rationale for the U.S. occupation of the Philippines after the Spanish-American War, as well as Woodrow Wilsons and Lyndon Johnsons similar duplicity during World War I and the Vietnam War, respectively. Had the highest priority been to thwart an emergent WMD threat, Saddam Husseins Iraq would not have topped the U.S. hit list, according to Higgs. Among the worst consequences of the Iraq War were the deaths of innocent civilians due to the (misnamed) precision bombing of densely populated areas, Higgs argues. A 2,000 pound JDAM smart bomb is supposed to strike within 13 meters of its target, as compared to an error range of 6070 meters for its less-sophisticated counterpart. But in Baghdad, a city of 6.4 million people comparable in area to Boston or Detroit, and in other densely populated Iraqi cities even this degree of precision could not guarantee zero civilian deaths. The inevitability of civilian casualtiesalong with the status of the Iraq War as an optional war of choicemade the decision to engage in aerial bombing highly immoral, Higgs argues. Yet for the U.S. policymakers who made the decision to attack, the future looks bright. Rather than face its failures squarely, the White House shifted its war rationale to emphasize that the world now has one less dictator. Was this outcome a net gain for justice? Had Americans known the consequences of invading Iraq, would enough of them have voluntarily paid a pro rata contribution of, say, $2,000, to cover all of the costs to the country? No, Higgs argues, that would have been an offer they likely would have refused.